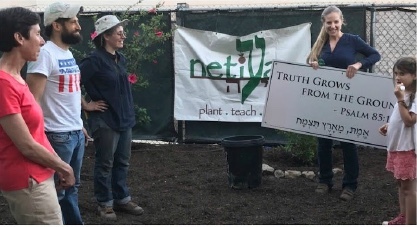 Netiya installed a kitchen garden and orchard at Shomrei Torah Synagogue (STS) in the San Fernando Valley. Netiya installed this model congregational Garden Orchard at STS with the help of STS members and community. Families and individuals that rolled up their sleeves included two rabbis, leaders from the STS and Netiya boards, and lay leadership of all ages. The Garden Orchard includes benches and pomegranate, citrus plum, and fig trees, as well as hibiscus, lavender, rosemary, tomatoes, zucchini, peppers, parsley, chives, sage, greens, lemon verbena, and native strawberries. It is hoped that in keeping with the Jewish tradition, at least 10% of the food grown will be tithed to address food insecurity in and around West Hills.